Before you know it summer will be upon us so now is the time to whip up some great clothes for your vacation. The first step in planning is to identify the clothes you will need. Consider the temperature, the length of your trip and your own unique figure type. 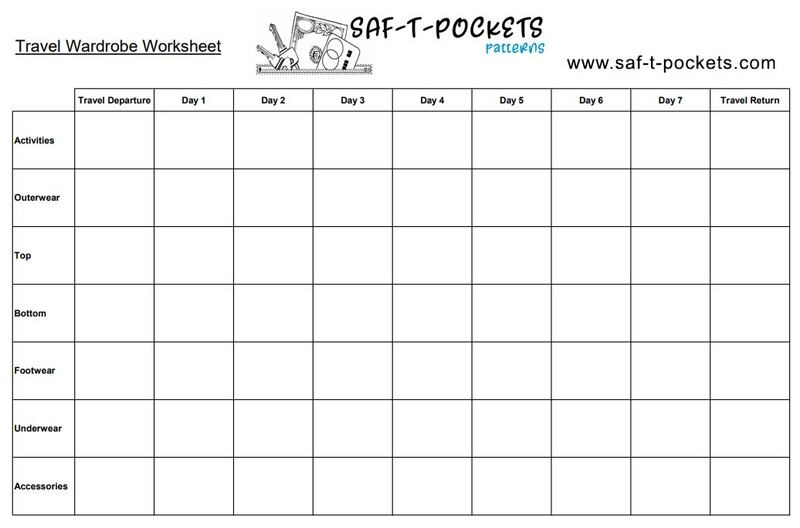 Make a list of daily activities either on 3 by 5 cards or our free Travel Wardrobe Worksheet below. This will help you record what will go into the suitcase. Pick two complimentary colors for your wardrobe. We like to use the principal of 2 plus 2 plus 5 = 30. Two suits (pant/skirt with jacket/cardigan sweater) plus 2 accessories (that can be worn with both suits) and five tops (that go with both suits). Using these outfits you can mix and match for 30 different looks. See our Capsule Wardrobe Worksheet below. Make sure your wardrobe is comfortable by using soft breathable fabrics and is appropriate for your destination. Look at the garments you own and decide what you will need to add. Purchase the less expensive items like T-shirts and tops and spend your value time making jackets, pants or skirts especially if you have fitting issues or want them made from matching fabric. Reversible clothing is a great way to expand a travel wardrobe. Garments can be made reversible by using finishing with binding at the neck, armholes and hem. Find fabrics that look different on each side and construct the garment using flat felled seams. Another idea is to use two layers of light weight fabric. We have designed a new pattern called Twice As Nice that uses this idea. It is a reversible pant and tank top with pockets that flip to either side. The pants also feature 4 zippered pockets. Made from two lightweight fabrics, this outfit will make a great addition to any travel wardrobe. Shoes are also a very important consideration when traveling. Feet get very tired with all the walking done on vacation. Bring along 2 to 3 pairs of shoes and change your shoes at least once during the day. It will revitalize your feet. Never purchase a new pair of shoes to take on a trip. Wear the shoes at least a month before traveling so you know they are comfortable. Buy shoes in the afternoon or late in the day, since feet swell as the day goes on. Make sure shoes feel good when you put them on. There should be no "break-in period". Check you shoes for wear and tear. You might need new shoes once a year or every three months. Place shoes on the floor. If the heels and soles aren't sitting flat on the floor, it's time to go shoe shopping. Using the above information you should be able to create an attractive, comfortable wardrobe that will serve you well on any vacation. Pre-planning helps eliminate bringing along more clothes than you need or ones that don't work well together. Fewer clothes frees up space to bring home fun things you find while on vacation. A suit can be a jacket, vest or cardigan sweater that matches a skirt or pant. They can be of the same fabric or fabrics in the same color family. Blouses or tops that coordinate with both suits. Using these 9 pieces of clothing you can create 30 different looks. For every extra skirt, pant or blouse you add the number goes up dramatically. It's fun, so experiment. It works!